“A photograph, no matter how emotionally wrenching, can only do so much,” wrote Paul Slovic and Nicole Smith Dahmen in QZ.com. The photograph referenced in their comment was that of three-year-old Aylan Kurdi, whose body was washed ashore on some Turkish beach in September 2015. It has been over a year since that tragic photograph – of an innocent child, face-down and lifeless – haunted and captured the attention of the world, alerting the international community to the urgency of the horrific war in Syria. Estimates vary, but it is fairly certain that anywhere between 400,000 and 500,000 people have lost their lives in Syria’s ongoing war, so far. Tens of thousands of those are children. The conflict in Syria is, perhaps, the most multifarious since the Second World War. There are too many parties and too many proxy wars happening all at once. 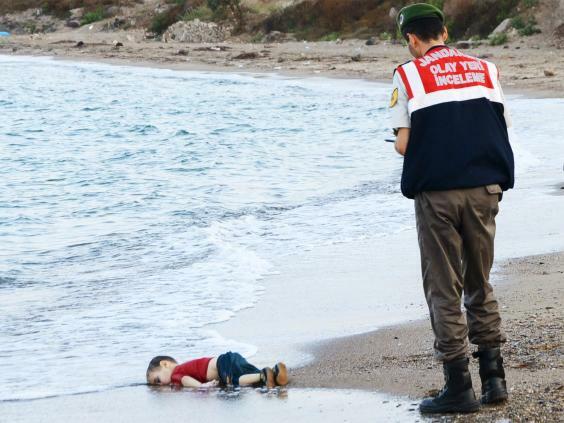 Despite the international despair generated by Aylan’s photo, the image was disturbingly used by various parties to validate their reasons for war. In some way, the photograph had, itself, become a weapon in the hands of the warring parties, as opposed to a rallying cry for an urgent ceasefire and eventual peace. In fact, current talks between the United States and Russia seem largely focused on achieving an accord that meets the political interests of two fiercely competitive countries and, to a lesser extent, their war proxies. The interests of the Syrian people – the likes of Aylan and his family – hardly seem paramount. This reaction to Aylan’s tragic death was no different from the more recent release of a photo of a five-year-old boy, Omran Daqneesh. His little body was seated alone in the back of an ambulance after being dug out from underneath rubble – his tiny hands on his lap, his face dirty, bloodied and dazed. This pitiful image was barely used as an opportunity to make a strong case of why a ceasefire must be reached; why the war must end. It was nothing more than a lost opportunity to unite the world in its anger and horror against this war. Instead, the picture found its way to the stifling media arguments made by those who continue to stoke the fire for yet more firepower and greater military interventions. The image of Omran Daqneesh was circulated not long after the beheading of Palestinian boy Abdullah Issa by a vile extremist. Instead of serving as a reminder of the revulsion against war, the horrifying video of the gruesome murder merely instigated a propaganda campaign by all sides of the war in Syria. What has become of Syria and its people? This nation that was unparalleled in its beauty, history, poets and intellectuals (which, like Iraq, have been equally destroyed) is now encapsulated in a mere photograph – of a dead child or another dying – in photos that make an occasional buzz on social media circles, but eventually fade away. It seems that the more the Syria war drags on, the more desensitized people become to its harrowing images. Quite often, the media grandstanding on Syria seems to translate to trifling or no action at all, even when a platform for action is presented. For example, the World Humanitarian Summit held in Istanbul last May was rightly criticized for failing to adequately address the greatest humanitarian disaster in over seventy years. Certainly, lots of slogans were tossed around and fiery speeches were made, but aside from verbal empathy and generalized media action plans, nothing much of practical worth was agreed upon. If the enthusiasm for war in Syria was met with similar enthusiasm in addressing its humanitarian consequences, the situation for Syrian refugees would have not been as dire as it is today. Syria’s population is 17 million people, of whom: 6.6 million are internally displaced in Syria itself and 4.7 million are refugees in the region (approximately 2.6 million in Turkey, 1.1 million in Lebanon, 637,000 in Lebanon, 245,000 in Iraq and 118,000 in Egypt); this is in addition to nearly one million seeking asylum in Europe, most of whom arrived on the continent atop small dinghies, and of whom thousands have died trying. According to Mercy Corps, of the whole population, 13.5 million Syrians are in need of urgent assistance, as many have perished to death or are dying because of malnutrition and starvation. One, as a way to exploit them to score pitiful political points – as many, unfortunately, do. Another, as a way to recognize the hideousness of the war and unite all efforts to end it, with a dignified political settlement that recognizes that in a situation so exceedingly grim, there can be no winners. But that political settlement cannot be an exclusive political affair, of concern only to the great powers. Aylan, Omran and Abdullah are dead, but it is children like them who will have to carry the burden of Syria for many years to come – to heal the deep wounds of their nation, to rebuild it, to struggle through the pain of coping with its bloody past. The best way to honor these children is by understanding that the future of Syria’s children cannot be determined according to the whims of American and Russian politicians but the Syrian people themselves. Meanwhile, we should all refrain from fetishizing Syria’s tragedy without having to contend with the roots of its conflict, or playing a constructive part in pressuring various governments to find a solution that would end the ugly war and spare the lives of children. Aylan, Omran and Abdullah and 50 thousand dead children in Syria deserve better, and the world has collectively failed them. We cannot deny that, but it is never too late to do our utmost to ensure the survival of those who are still alive, subsisting in refugee camps or on the run in their own country, or whatever remains of it. If even for a minute, had the politicians of USA or Russia and Isis extremists had seen the faces of these innocents sincerely, such gory battles would not have been taking place. But, nobody thinks of the children who die in the war. The only aim is to plunder resources and occupy the lands. Humanity has lost its meaning to the political sadists.